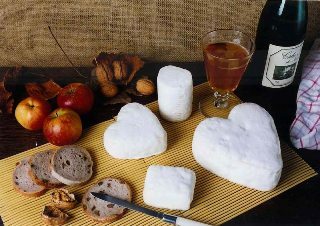 Neufchâtel is a soft, slightly crumbly, mould-ripened cheese made in the French region of Normandy. One of the oldest cheeses in France, its production is believed to date back to the 6th Century. It looks somewhat similar to camembert,with a white, edible rind, but the taste is saltier and sharper. It isusually sold in heart shapes, however it is also produced in other forms, such as logs. It is typically matured for 8–10 weeks. This cheese was commonly used in British forms of Cheesecake. It is also used as the base for a type of cream cheese popular in the United States.